The first and most important thing to keep in mind if you are hoping to have a happy existence as a fanboy is that medium matters. A book is a book, a comic is a comic and so on and so forth. Each medium has its own rules and limitations and conversely benefits. If something achieves perfection within its form it is therefore referred to as a masterpiece. It is very difficult but not impossible for a story to be that well told in more than one medium. Now how to gauge whether or not a film has achieved such a lofty height cannot and should not be decided based on a comparative analysis. There is merit to examining the decisions made in adding and omitting and transforming material from other mediums to film but such discussions are typically more adept to academic scenarios and not germane to analyzing the quality of a film. I will even have occasion to describe a film I saw and cite that I thought it should’ve done X when it does Y, Case 39 is a prime example of that, however, that should not influence one’s overall opinion of a film. You must look at what is presented you and then decide if it works based on what is there not what you wish is there. That should apply to films as well. Another illustration would be Star Wars: Episode III: Revenge of the Sith. 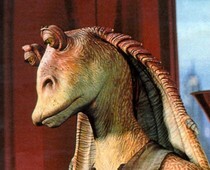 I was hoping against hope that amidst the bloodshed would be the headless corpse of Jar Jar Binks, alas it was not to be. Yet that didn’t color my entire view of the film. It still would’ve been bitchin’ though.